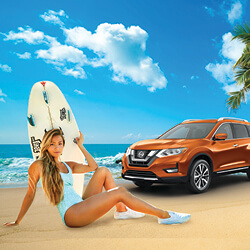 Nissan is a proud sponsor of the 2017 SuperGirl Surf Pro event, the largest women’s surf event & festival in the world! This 3-day event is packed with pro-surfing competitions, pro-skateboarding and BMW exhibitions, and even a celebrity surf competition! Plus, other activities like live bands, food trucks, female inspired speakers and more at the festival village! Event is free to attend. All ages are welcome! Meet Tia Blanco, Pro surfer & winner of the first place Gold medal at the 2015 International Surfing Association Open Women’s World Surfing Championship. She will be singing autographed photos all 3 days at the Nissan booth located in the Festival Village. You can also catch Tia in the new 2017 Nissan Rogue with LeBron James on Uninterrupted, a new series focused on exploring challenges told by athletes themselves. Mossy Nissan and the Oceanside Police Department partnered to outfit the new 2017 Nissan Titan XD as a police service vehicle. Come check out the Titan OCPD vehicle on display at the SuperGirl Pro Surf event located at the Nissan booth! OR visit any one of our 7 Mossy Nissan locations in San Diego to check out the new 2017 Nissan Titan XD Cummins® Diesel with available 555 lbs of torque!